In Defence Of InBox Zero And Why You Should Be Using It. Inbox Zero is an email management system created by Merlin Mann around 2006. The basic concept is there are only four things you can do with an email when it comes in: Reply, delete, defer or delegate it. This means when you are working on an email you do one of these four things with it and move it from your inbox. The idea is that by the end of the day, your inbox will be zeroed out and all emails will have been dealt with appropriately. Merlin did a great talk at Google Talks that is well worth watching for a full breakdown of how the system works. These days, inbox zero appears to be out of fashion and I find it hard to understand why. I have seen articles and comments likening inbox zero to being Sisyphus forever rolling a rock up a hill, suggesting inbox zero is a waste of time and not a practical way to handle email because it’s a never-ending task. And yet, since I adopted the principles of inbox zero around 2009, I have never had any problems with email. No overwhelm, no difficulty finding anything and I generally reply to email in a timely manner. The same, of course, can be said with anything related to becoming better organised and more productive. Many things in life will feel like Sisyphus rolling a boulder up a hill. Putting clothes away at the end of the day is a never-ending task. Doing the dishes after eating a meal, or writing the weekly sales report. These are all never-ending tasks. If you don’t do these tasks, things will mount up and become a huge mess. Never putting clothes away after you have worn them will eventually make it difficult to find the clothes you want to wear when you want to wear them. Not doing the dishes at the end of the day will result in you not being able to find a clean cup in the morning for that life-giving first cup of coffee. This also is the case with email. If you are not dealing with email as it comes in, it is going to mount up and become a cesspit of overwhelm and disorganisation. Finding that important email, sent to you last month, will take up a disproportionate amount of time because you cannot remember the correct spelling of the name of the person who sent it to you. And your suppliers, and in many cases, your customers will feel you don’t care because you didn’t take the two minutes it would take to respond to their message. The importance of good email etiquette. Any email that requires a reply has been sent by a human being. It is simply polite to reply in a timely manner! It shocks me the number of times I have answered a complete stranger’s question and not received a simple thank you reply. I don’t mind, but if I reach out to a stranger for an answer to a question, I always have the courtesy and good manners to thank them for their answer. If your email is a mess, you cannot claim to be a productive person. However, the deeper issue here is how can anyone claim to be a productive, organised individual if their email organisation is non-existent? Maybe their to-do list is beautifully set up, their notes app has a sophisticated structure that manages their notes in a complex hierarchical structure and yet their email inbox has thousands of opened and unopened emails. That is not the character of a well organised, productive individual. It’s a sign of laziness. If you are striving to become a better organised and productive person, you cannot do it by half measures. It’s an either all in or not at all way of life. It’s like someone running 10km every morning for their health but smoking twenty cigarettes a day, eating burgers, pizza and cookies and downing eight pints at the end of the day. You’re not living a healthy life. Of all the email organisation systems I have come across over the years, inbox zero is by far the best system. As soon as an email comes in, I ask the questions: “what is it?” And “what is the next action?” Whatever the next action is I do it. There are only four things I can do with an email. Deal with it if it will take me less than two minutes. Defer it if I need more than two minutes. Delete it if it has no value to me or forward it on to a person who could handle it better than I could. This is not on a level with quantum physics. It is simple and with practice, you get incredibly fast at it. Email is one of the best communication methods ever developed. It allows us to communicate with people on the other side of the world in an instant. It allows us to send documents, confirm reservations and receive important information. It is a fundamental part of any system, just as important as your to-do list and notes. If you want to become a more productive, organised person you need to treat email in the same way you treat your to-do list manager and notes app. Have a system in place that organises your mail so they are easy to find when you need them and always remember that when another human being sends you an email, they have taken valuable time to write to you and so the least you could do is reply with a simple thank you. 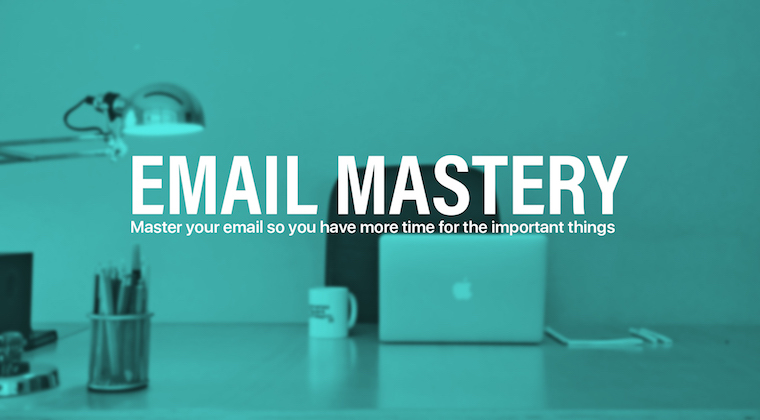 Find out more about my 2018 Email Productivity Mastery course right here. Learn how to implement the system described in this post and become an master of email productivity.